The more we consume, the less we care about the living planet. That didn’t take long. The public interest in the state of the natural world stimulated by the winter floods receded almost as quickly as the waters did. 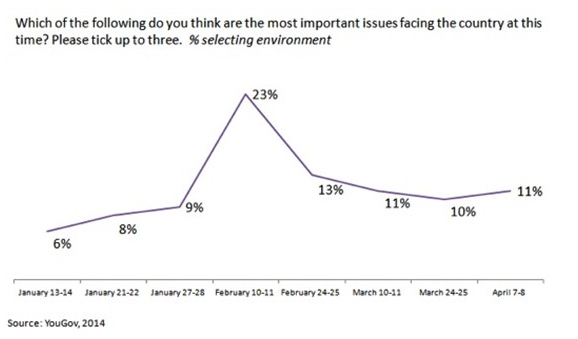 A YouGov poll showed that the number of respondents placing the environment among their top three issues of concern rose from 6% in mid-January to 23% in mid-February. By early April – though the Intergovernmental Panel on Climate Change had just published two massive and horrifying reports – the proportion had fallen back to 11%. Why is it so difficult to persuade people to care about our wonderful planet, the world that gave rise to us and upon which we wholly depend? And why do you encounter a barrage of hostility and denial whenever you attempt it (and not only from the professional liars who are paid by coal and oil and timber companies to sow confusion and channel hatred)? 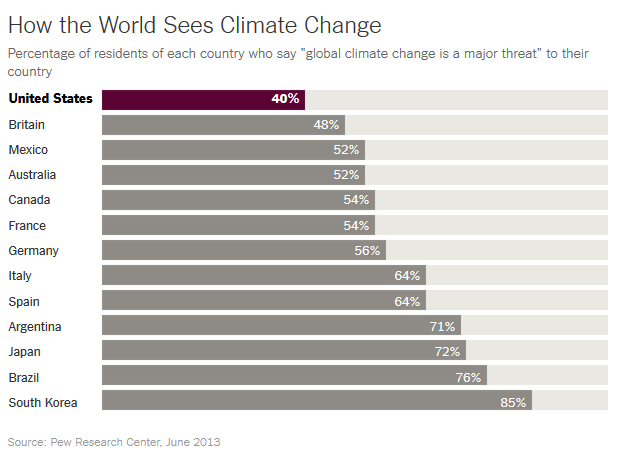 The first thing to note, in trying to answer this question, is that the rich anglophone countries are anomalous. 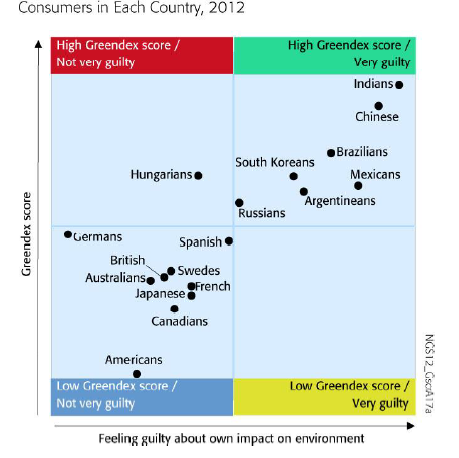 In this bar chart (copied from the website of the New York Times) you can see how atypical the attitudes of people in the US and the UK are. Because almost everything we read in this country is published in rich, English-speaking nations, we might get the false impression that the world doesn’t care very much. But we’re not “the only people out there in front of the rest of the world.” In fact we’re not in front at all. As this map produced by Oxford University’s Smith School suggests, we are some way behind not only some other rich nations but also a number of countries much poorer than ours. The richer we are and the more we consume, the more self-centred and careless of the lives of others we appear to become. Even if you somehow put aside the direct, physical impacts of rising consumption, it’s hard to understand how anyone could imagine that economic growth is a formula for protecting the planet. So the perennially low level of concern, which flickers upwards momentarily when disaster strikes, then slumps back into the customary stupor, is an almost inevitable result of a society that has become restructured around shopping, fashion, celebrity and an obsession with money. How we break the circle and wake people out of this dreamworld is the question that all those who love the living planet should address. There will be no easy answers.